This article was written by guest author Bryce Merrill, coach of the Brigham Young University men’s team. Reset sequences serve as the backbone of many offensive sets. 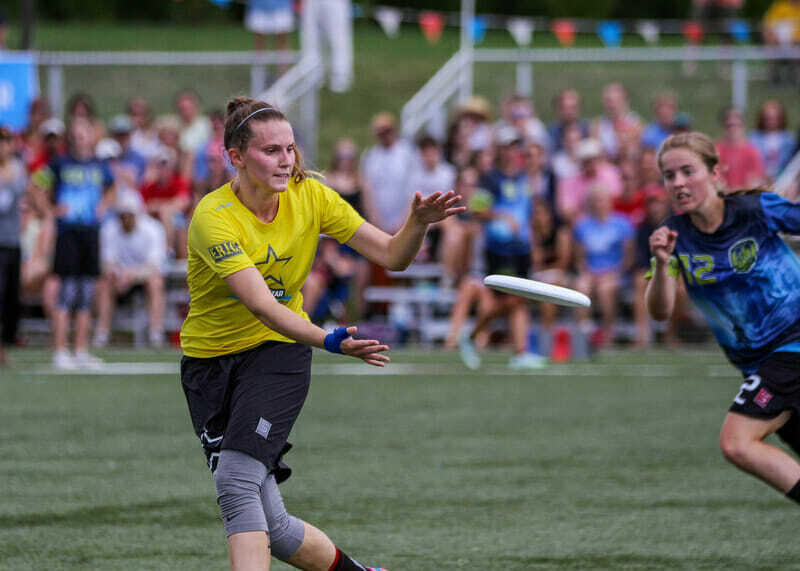 Understanding when and where your handlers will move the disc empowers cutters to create space and time their cuts to get the best chance at separation from a defender while gaining valuable yards. The upline cut is perhaps the most valued part of the reset sequence—a single cut that has the ability to flatten marks, send defenders into the deep space at the expense of open side unders, and pull poaches out into the lane to free up other cutters. Learning to get open on these valuable attacks will create opportunities for your team to move the disc more easily and score. How do the best handlers consistently get open on their uplines? And where are they attacking during the sequence? How do they keep their defender guessing which space they’ll attack next? Creating some system-based answers to these questions empowers the thrower, the upline handler, and the fill/reset handler to all move more aggressively as they learn to understand their timing. Not every team should employ every option every upline listed below. Instead, find what works for your throwers and handlers; figure out your timing, your calls, and your spacing, and use the options that best meet the needs of your team’s system. Great cuts are often great before you’ve ever started running. Identifying the ideal location to start your cut can be just as important. Typically you’ll be in movement to get to the ideal starting location of your upline cut during the initial two to three stalls of a possession. While your teammate looks downfield, get to the position that best stretches your defense. Being in a position where the thrower has available space to attack on the around and IO lanes gives them options when they activate you in the stall. Make sure you’re spaced far enough away from the disc. Want an extra half second to get open? Instead of watching the thrower and waiting for them to activate you, watch their downfield cutters and options. Once you recognize that those aren’t going to work and you’re about to be activated, get ahead of the play and get to full speed, turn your defenders hips, close the space, etc. while your thrower is marking. This will give you time for a stop-and-go, seven-cut, or some other razzle dazzle later in the stall count. You need to space to run towards. Your thrower needs space to throw at. Make sure you design and time your cuts in a way that maximizes that space for both of you. While aggressively running and cutting can be a great way to create separation from a defender, doing so at the expense of space can sometimes make upline cuts more difficult. If, at any time on your upline cut (including before you cut), you find that you already have space for your thrower to throw towards and you have a step between that and your defender, you might not need to cut. Don’t just run away from your defender—create space. Practice running routes where you initiate and your thrower responds. Practice running routes where your thrower initiates (with both pump fakes and then the actual throw) and find what works for y’all. Communication, verbal and otherwise, between cutter and thrower is key! Close the space between the defender. If you find that your defender is able to maintain a cushion of space, they’ll often be able to challenge a number of your throwers options. Instead, close the distance so they’ll have a harder time adjusting to your cuts without committing their hips. Use your whole body. Once you’ve closed the gap and aggressively turned their hips, use your body to seal your defender out. Combined with a strong ‘stick step,’ turning your head, shoulders, and even hands can help force a defender to overplay a particular space and create an opportunity for you and your thrower to connect. Let your thrower help! Great handler defenders are constantly triangulating—seeing both the thrower and cutter to ensure they remain in aggressive defensive positioning. Make sure your thrower understands their role in getting you open—a strong lefty backhand pump to the IO can reverse the defender’s momentum and turn their hips back towards the disc. With some well-grooved communication, you can then walk on to an ankle-breaking, crowd-inspiring upline cut! Comments on "Tuesday Tips: Getting Open Up The Line [Pt. 1], Presented By Spin Ultimate"